C hampions of Chaos II. 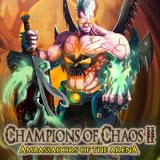 Ambassador of the Arena. Favorite Game. The Second Fighting Tournament begins, and only one will survive! Will it be you? Everything .